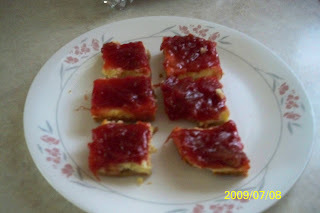 Tried a new recipe again using Rhubarb. RHUBARB CHEESECAKE DESSERT. It is similar to one I made before but much much better. The picture is what is left after sharing with the neighbors. and vanilla. Press into a greased 13-in. minutes. Stir in food coloring if desired. 1 hour. Yield: 12-15 servings.